Looking for an Android handset with a physical keyboard at an ultra affordable price? Well look no further, Wirefly to the rescue! The folks over at Wirefly are offering the T-Mobile Motorola Cliq (Titanium) at an incredibly low price of $10! The offer is available to new customers willing to sign a 2 year contract with T-Mobile. 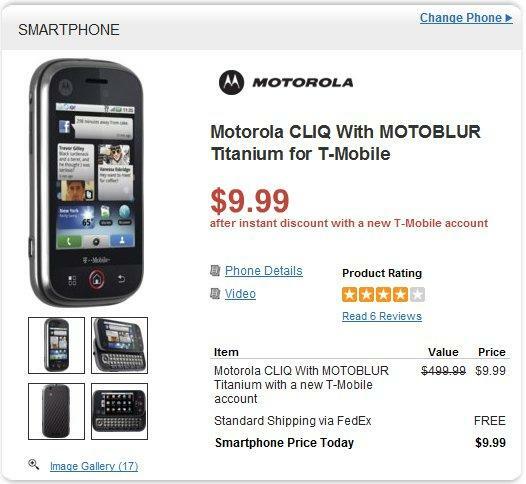 The Motorola Cliq originally $149.99 with a 2 year contract (Through T-Mobile), can be yours today for 10 bucks. It’s not often you come across deals such as this one, and if you’ve been waiting for an Android phone with social networking at your fingertips, this would probably be your best bet! Just a heads-up, make sure to read all the terms and conditions before purchasing the device. I agree with other Chris, nothing is free or too cheap, there is always catches, buy direct and save headaches later! Yea I got screwed on a phone that I’m still paying on. If you go through wirefly make sure you check your phone bill. Ugh.. I’d rather wait for this summer for the Iphone. Already getting excited looking at German T-mobile Site..
Just because it’s on the German t-mobile doesn’t mean t-mobile is getting it in the US. I believe I ordered my first Sprint phone through wirefly or one of it’s skinned websites. It wasn’t too bad, but I hear way too many problems now to even consider them. One thing you can do is print out the Wirefly deal and take it to a T-mobile store and they’ll match the price. That’s how I got a $200 phone for free from them a few years ago. Most of them wont honor that though now. ROFL! No way T-Mobile would sell the Cliq for $10 so get over your self on price matching. If another point of sale has it cheaper and you want it that bad then go to them. I would never shop at Wirefly, too many problems. And as a CSR it has been a headache as people call in and expect the carrier to do something when they don’t read the contract they get with Wirefly and our own ha. It’s a good thing for people who want and can’t afford but they better read what they get them selves into. I have to jump in here. A lot of independent T-Mobile dealers like to spread rumors about Wirefly because they don’t like the competition. Wirefly does not sell any refurbished phones. If we did, they would be merchandised and priced accordingly. As the Internet’s #1 authorized T-Mobile retailer, Wirefly activates only devices approved and shipped from T-Mobile distribution centers, with full U.S. Warranty. Wirefly is owned by Simplexity, which also runs the cell phone shopping sites for BestBuy, Radio Shack, Newegg, Dell, Overstock, Sams Club, Sears, Target, and many others. Our Satisfaction Guarantee covers returns for ANY reason and includes free return shipping. Personally, I am a T-Mobile customer and have purchased my last 2 phones from Wirefly. I won’t be buying from a store ever again. I gotta defend Wirefly on this one. In the past, I’ve NEVER had a problem with mail in rebates, refurbed phones (they come in the same T.Mo box as they do at the store), or exchanges. I also like that they don’t jam accessories down your throat like the rabid store reps (who are otherwise nice) do. Just make sure you keep “mandatory” data plans active for 61 days and you’ll be fine. I also have to give the above poster credit for being honest about being from Wirefly… I loathe companies that use shills disguised as joe commenter to troll the web. ive bought a phone from wirefly before. no problems what-so-ever. I’ve purchased from both Wirefly and LetsTalk and never had a problem with either one. Even did an exchange from LetsTalk because I wasn’t happy with the original phone I ordered. As long as you carefully read and follow the Terms and Conditions, you usually end up getting a great deal on phone prices. Seems that reps from Wirefly are putting good words for themselves. Notice the names and their feedback, can you make it any more obvious? In the end, Wirefly is known for being sneaky, DIStrusted sellers. In fact T-Mobile is soon going to discontinue their services with Wirefly as well as a few more disclosed retail stores. Wirefly, dont give T-Mobile reps a bad name, thanks.